Right at the heart of Tel Aviv you will find Kikar Habima (Habima Square), it is at the intersection of two of the city’s busiest streets, Dizengoff and Rothschild Boulevard, and offers a huge amount for visitors to explore. The square is somewhat of a cultural oasis set apart from the busy chaos and commercial streets of the surrounding area and it has become a popular meeting spot for locals and tourists alike. In the centre of the square you will find a sunken garden which attracts all kinds of people and it is common to see people relaxing and reading books, young families spending time together and children playing in the sandpit. As a result it is a great location for people watching and to enjoy the buskers that come to perform. 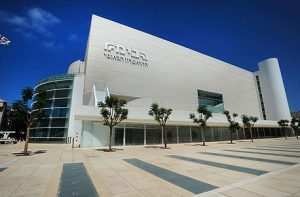 The name ‘Habima’ literally means ‘the stage’ in Hebrew and it refers to the adjacent theatre. However, since the rejuvenation of the area it has also come to refer to the square itself and reflects the vibrant display of public life that can be found. At first glance the square isn’t really much to look at. However, it has deliberately been given a minimalistic design in order to focus attention on the refurbished Habima Theatre and the Mann Auditorium, both of which have undergone extensive renovation in recent years. However, in the evening the square is lit up and the view of the brightly lit interior of the theatre also adds a touch of dramatic flair. The square has also been designed to reflect the history and the character of the location. The gardens have local vegetation, such as cacti, lavender and almond trees, which is the same as could be found before the square was renovated. It is worth taking some time to explore the various aspects of the square, from the more intimate corners of the gardens to the water basins and the impressive surrounding architecture. Of course, like everywhere in Tel Aviv, you will also find some great places to eat and drink in the area. A favourite with locals is Café Habima, also known as We Like You Too, where you can sit and relax with a cappuccino and a sandwich and blend in with the locals. Just a few minutes’ walk away is King George Street which is a lively and colourful location with plenty to enjoy. There are numerous cafes and shops and of course the huge Dizengoff Centre. You can also stroll along the tree lined Rothschild Boulevard and enjoy the benches, watch the cyclists in the bike lanes and people playing in the mini-playgrounds. In short Kikar Habima and the surrounding area offers a huge amount for you to explore during your gap year. While you may not want to hang out there in all of your free time, it would be a shame to miss it completely and you are bound to find a few places that you’ll want to return to time and time again.